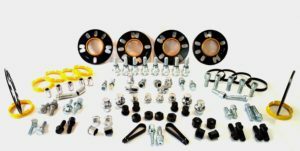 Wheel Accessories – Nuts, Bolts & Spacers etc. LTC tyres offers a wide range of wheel accessories to suit both aftermarket and OEM (genuine) alloy wheels. Our TUV approved products are designed and manufactured to the highest quality in Italy. With over 30 years experience in the wheel industry we pride ourselves on our product knowledge and technical know-how. Our expert wheel specialists are on hand to answer your enquiries and are happy to offer advice.. Please visit our store or call us today 01384 898014.